We use only authentic crystal for all of our Necklaces. All necklaces come with 18-inch Hamilton gold or silver overlaid chains. All merchandise comes carded . We offer a two sided counter oak spinner display. This display is 18 Inches tall, 8 1/4 inches wide, and 5 1/2 inches deep. This display has 24 oak pegs, 12 on each side. 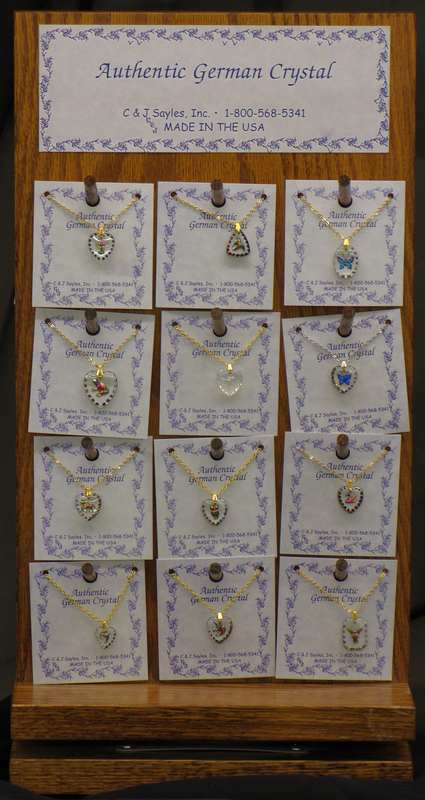 This display comes with 24 different necklace styles. Wholesale cost is $4.00 each. There is a $25.00 charge for the display and is offset with free merchandise. This display is shipped U.P.S. with the merchandise on the display. Display charge included in above prices. You may order a 48 pc assortment (2 each 24 styles) , no display for $192.00.